Fig. 1: Measurement principle of SAEMS: Effekt of Molecules and aerosol particles on the intensity of light. The wavelength-dependent extinction coefficient of atmospheric particles under ambient conditions is determined with SÆMS. 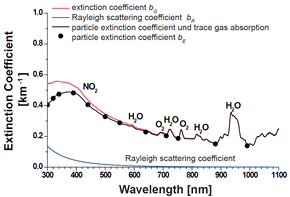 Atmospheric molecules and particles can scatter and/or absorb light. The light intensity is attenuated during the passage through the atmosphere (Fig. 1) depending on the wavelength. The lost of light intensity is described by Lambert-Beers law (Eq. 1), where I0 is the emitted light intensity,IL the light intensity after passing through the medium (atmosphere) of the path length L. The extinction coefficient bG is the sum of the Rayleigh scattering coefficient (scattering of the light at molecules), the absorption coefficient of the air molecules, and the extinction coefficient of the atmospheric particles bE. Fig. 2: Setup of SAEMS. The setup of SÆMS is shown in Figure 2. The light source is a xenon-arc high-pressure lamp. The transmitting and receiving telescope is located in the roof laboratory of the TROPOS main building. 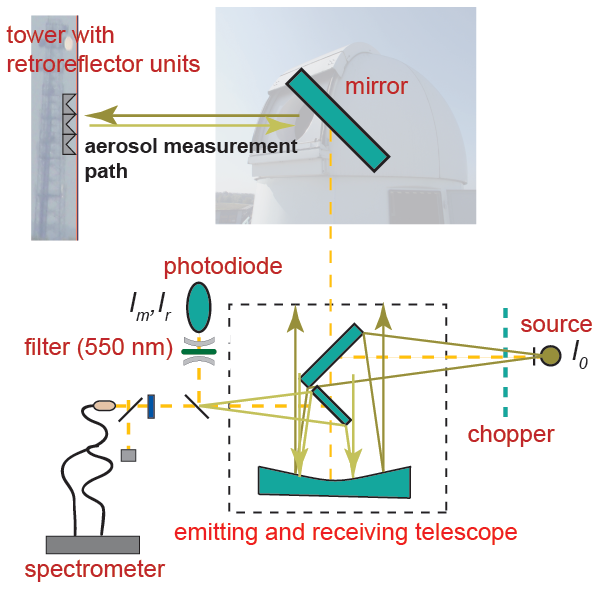 The light is directed to the horizontal aerosol measurement path with a rotatable and tiltable reflection mirror. The optical path has a length of 5.7 km (30 to 50 m above ground). The light is reflected back by retroreflector units. 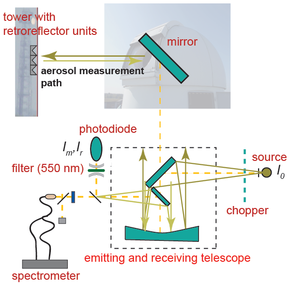 The detector unit consists of a spectrometer (300-1000 nm, 10 nm resolution), a water vapor spectrometer (850-1050 nm 0.05 nm resolution) and a large-area photodiode with a filter (550 nm). The instrument is fully automated. Fig 3: Example of a full spectrum measured with SAEMS. A typical overall spectrum with narrow gas absorption bands is shown in Figure 3. 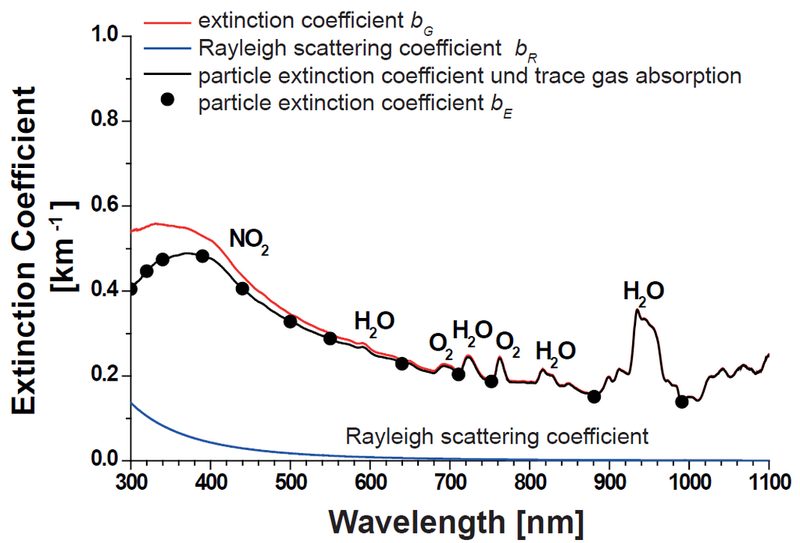 After subtracting the Rayleigh scattering coefficient, the particle extinction coefficient is evaluated in wavelength ranges that are free of gas absorption bands. The temporal development of the extinction coefficient is measured, and the extinction coefficient as a function of wavelength. From the spectral information of the measurement the particle size distribution can be derived. In the focus of the studies is the dependence of the extinction coefficient on the relative humidity, especially at very high relative humidity (near 100%). See here for first results.